Sydney’s Pyrmont could one day match the density and height of Sydney’s CBD, with new vision showing the current CBD extending into the Pyrmont peninsular by 2040, reports The Urban Developer. 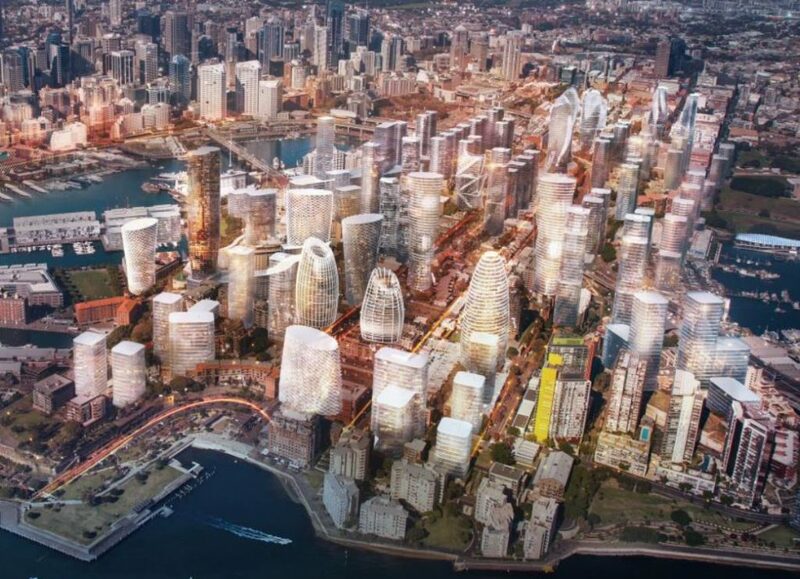 Developer lobby group Urban Taskforce is pushing to develop the peninsula as Sydney’s next high-rise centre, endorsing the densification of the area as support for Sydney’s CBD. Sydney architecture firm LAVA—European Architects of the Year in 2017—has released a vision of how a dramatically densified Pyrmont could look as Sydney reaches 8 million people over the next 40 years. Urban Taskforce chief executive Chris Johnson says a long-term plan is needed to continue Sydney’s status as a leading global city. “We see the peninsula next to the Sydney CBD as being a genuine mixed-use precinct with entertainment and hospitality uses as well as being a focus for IT and creative industries,” Johnson said. Johnson says that recent development in the area is a step in the right direction. “The regeneration of Darling Harbour with its high-rise hotel has begun the change,” he said. “The proposed 61-storey tower for the Star Casino begins a rethink of heights on the peninsula along with the proposed tower at Harbourside. New images of the revitalised fish market in Blackwattle Bay was unveiled last week, with the proposal set to include new public wharves, a promenade, and a new ferry stop. A development application for the controversial Star Casino was lodged in August, while the NSW government is considering rezoning the former Ultimo home of the Powerhouse to allow for more than 100 apartments. Johnson said the peninsula would support the long-term proposals for the Bays Precinct. “Clearly public transport will be essential for the new uses so we support the location of a station on the Metro West line as it connects to Parramatta via the Bays Precinct and Sydney Olympic Park. “The metro station should be located so that it serves the Star Casino and the new Fish Markets development.